What makes this or that bird one we want to see on our next birding trip? Personal preferences are important, but there is certain criteria each species is tested against before it gets on the short wish list. I for instance, asked which birds would be on the wish list of someone visiting Peru, and what criteria birders use to generate such wish list. Furthermore, I thought, the wish list of an experienced Neotropical birders would be different from that of someone visiting the Neotropics for the first time. I assume a first-timer would grab a book [Birds of Peru] and go through the list of possibilities to then, put together such list largely based on looks. The more showy and colorful a bird is, the more likely to make it to the trip’s wish list. A novice birder looking at the hummingbirds section of the book is likely to be overwhelmed by the similar looking Neotropical hummers. 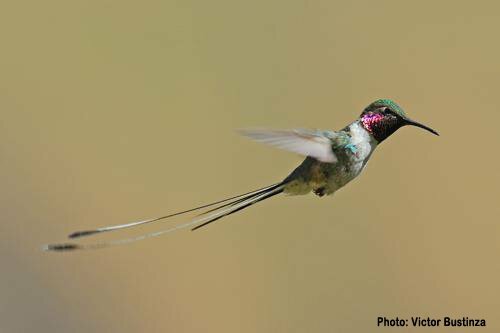 The Marvelous Spatuletail has long tail feathers and terminal racquets, but there are other hummers with spectacular coloration and bizarre appendages. 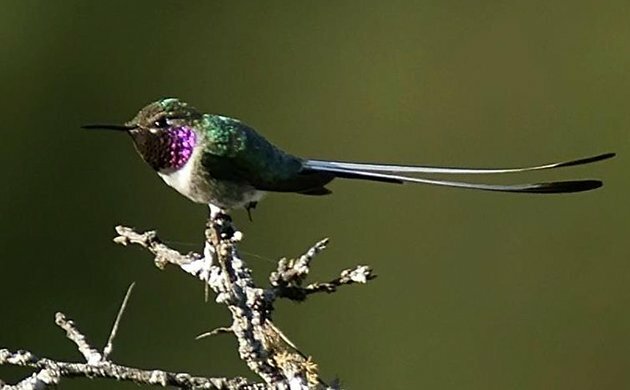 Or staying within the long-tail hummingbird theme, the Peruvian Sheartail has a similar coloration as the spatuletail and features a long tail without a terminal racquet. 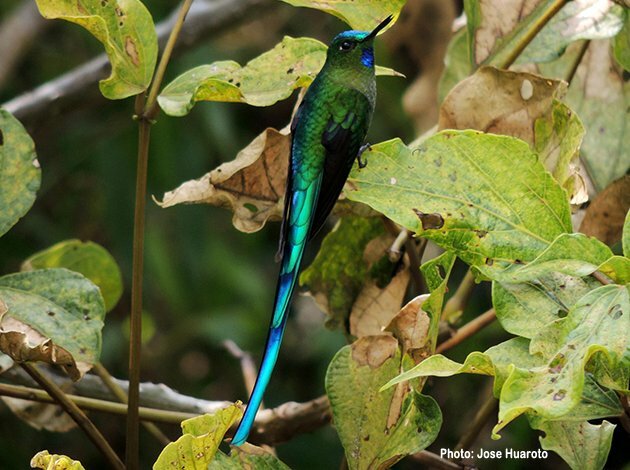 The Long-tailed Sylph features a spectacular iridescent long tail. Based on looks only, it is a hard choice; these long tail hummingbirds are all good candidates. I took to the internet, and it did not take me long to run into Don Roberson’s 50 Best Birds in the World (Google). He asks, what make a bird a candidate for a wish list, and he has been toying with this question for about 35 years! A rather experienced birder himself, his list of 50 Best Birds in the World regard looks as only one of five criteria. To qualify for his 50 Best Best Birds, a bird has to be impressive, unique, rare, hard to find, and has to have an interesting story or circumstances surrounding it. He assigns a numeric value to each category, and while subjectivity is likely to influence the final score, the system seems robust; it provides consistently similar results. This exercise of selecting a bird for a wish list may be beyond what a novice birder would do though. The Peruvian Sheartail is a bird I’ve known for a long time. Adult males seen in good light are impressive. The same holds for other hummer in the “long tail” theme including trainbearers and sylphs. These hummers look spectacular. A novice birder would pick them for his or her wish list based on just looks. But Sheartails, trainbearers and sylphs, are fairly common and widespread over large areas. Some species even occur in urban areas and are not in any category of threat. The spatuletail on the other hand is rare, is a monotypic taxon, is restricted to a few inter-Andean valleys, and is categorized as threatened with extinction. These criteria elevate this species above the similar looking long-tailed hummers. 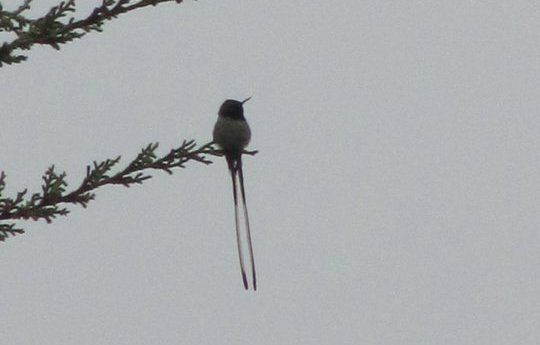 And when it comes to “special circumstances surrounding the species” the spatuletail takes the lead. The Marvelous Spatuletail has a rather impressive command of the two racquet feathers, part of a total of four feathers in the bird’s tail. They are seemingly able to arch their tail feathers in ways that give the impression the feathers have a nerve or muscle the bird is able to control; but not, they are just specialized feathers. 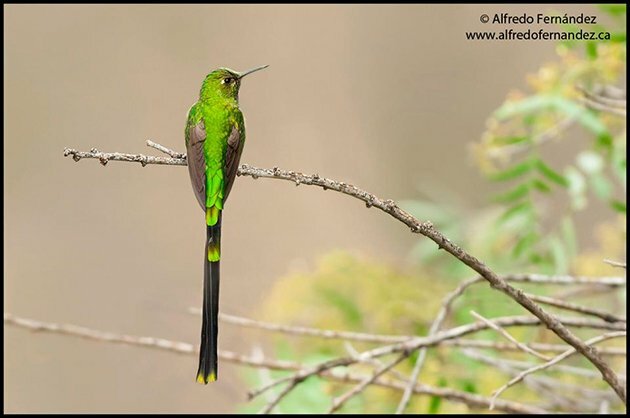 As I try to highlight how cool Peruvian Sheartail and Long-tailed Sylphs are, the looks and other criteria make spatuletails a serious candidate for anyone’s wishlist. With such name as Marvelous Spatuletail, it is no wonder this bird is ranked number 9 on Don Roberson’s 50 Best Birds in the World. These hummers may look similar on the book, but there is more in a long-tailed hummingbird than what meets the eye. Bah. Glorified sunbirds is all…. 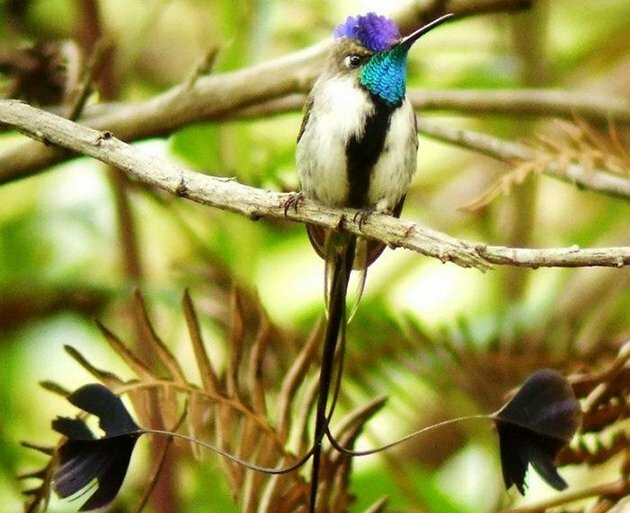 Also, I want to see a Marvelous Sunbird… I mean Marvelous Spatuletail. Yeah, they look alike and do similar things too.